Hamilton's car had a mechanical problem at the start of his first run, which was repaired in reasonable time but still cost him his originally planned running and left him occasionally belching smoke from his exhaust in an alarming fashion, but apparently not a serious thing judging by the mien of his engineers, at least after he made it round the track the first time without a terminal failure. Green Light!! With the clouds ever closer, there was a queue at the end of pitlane as the track opened, the track temps had dropped to the mid 30's and contra usual procedures, with rain in the offing both Ferrari and Mercedes were amongst the hoi polloi. Bonnington told Hamilton on the radio rain was expected and it was Bottas first off on his hotlap with everyone on the Supers. Hamilton was purpling the sectors behind him, and behind him it was Raikkonen even faster, until he made a mistake in the final corner. Nevertheless, he was still a wee bit faster than the Mercedes, but it was Verstappen who had the first properly good lap, with a 1:08.205. Leclerc had a remarkable outing, going P6 just 0.3 seconds slower than Ricciardo and it was Vandoorne, Sirotkin, and Stroll on the outside, looking in as the Toro Rossos were yet to set a time. Gasly P15 and Hartley P17 and with 10 minutes left to go, it was Bottas who was furthest off, as he was blocked going into the final turn on his fast lap and drops were reported on the outside of turn 12, and it was turn on the lights dark over the backside of the track. On the Supers, 2nd efforts were not making much of a difference, even as fuel was being burned off. 8 minutes to go and the track was still alive with activity, Perez up to 10th as the usual interlude was simply not going to happen thanks to the weather. Grosjean to P8 with his run and then it was Sirotkin, ahead of Ocon for the moment and up to 13th. Leclerc nudged ahead of Grosjean and Hulkenberg was up to P11 as the names were bouncing up and down the board with alarming rapidity. Ocon was on it, big lockup into T10 but still managing P14 and putting Alonso out with 5 minutes left and the weather worsening according to Hulkenberg who reported heavier rain over the back of the circuit, on turns 4 and 12. Gasly was on the radio and his call was "it's raining, it's raining," followed by a long bleep, the sound of someone who's left it a bit too late in P17. Still, it was P12 at the end of the day, and there was time still to be found. Under 2 minutes and it was now Sainz in P17, with it all to do, while Alonso on the radio amusingly asked to be told when people started going off. P16 for Sainz and that was the end of that, as he lacked the resource to put in another full push lap. Stroll improved massively from P20 to P19 (yes, I couldn't resist), making Vandoorne the lanterne rouge. Sainz, Hartley, Alonso, Stroll and Vandoorne were done for the day off in search of some Pao de Queijo whilst the rest turned it around for Q2. Notable for other reasons, Kmag pulled off a P5, ahead of both Ricciardo and Bottas, with Leclerc ahead of Grosjean in P8 and Renault looking not particularly competitive at this circuit. IT was again a mad rush for the pit exit at the start of Q2, with the rain there or thereabouts, and Leclerc ready to be first off, Trailed by Ericsson, Kmag and Grosjean and Hulkenberg. Supers for all, the imminent rain putting the kibosh on the plans for Ferrari and Mercedes to try and sneak through on the Softs to Q3. 4 minutes to rain, one and done then for the shot at the ultimate glory of Q3. Raikkonen was in, along with Vettel and Ferrari was quick to pull the strategy switch, and both Ferrari's were in for the Soft tyre. Meanwhile, it was Ericsson fastest of the first bunch, with the top teams pounding towards the line. Bottas, Hamilton, Verstappen, then, in that order as Ferrari were dragging around on their outlaps on the Softs, rain increasing every second. Bang, off went Raikkonen, and the rains held off, up to P4 as Red Bull was into the pits and copying the strategy of Ferrari. Vettel, on the Softs, up to P2 as the Softs seemed to be working better on the cool track. 8 minutes to go and Hamilton just about took out Sirotkin, moving directly in front of him as the Williams headed for the final turns and the start of a push lap. Verstappen just missed improving on his Super soft time and Ricciardo, too was unable to best his banker, meaning only Ferrari would have the advantage on starting on the Softs. Kmag managed to improve with 7 minutes left, up to P10 and then it looked as if the track conditions crossed, with no one able to improve as the track got greasier and greasier. 4 minutes to go and Leclerc, Perez, Ocon, Hulkenberg and Sirotkin looked done, off for caipirinhas early, with the track done for the session even with time left. Mercedes, too, had a go on the Softs, but the track was too slippery and even prior to ruining Sirotkin's lap, Hamilton was slithering about demonstrating how badly the track had degraded. Leclerc, again was first off, followed by Ericsson, and still not wet enough for the intermediate tyres. They were trailed by pretty much the entire rest of the field, but it was a respectable 1:08.432 for Ericsson as it was Vettel lighting the board purple as the big boys were fully underway. Behind Vettel, Bottas reset the fastest time for S1 as Raikkonen was first to the top. Vettel cracked that time, with a 1:07.301 and only Hamilton was able to outdo him, by a mere 0.073 seconds. 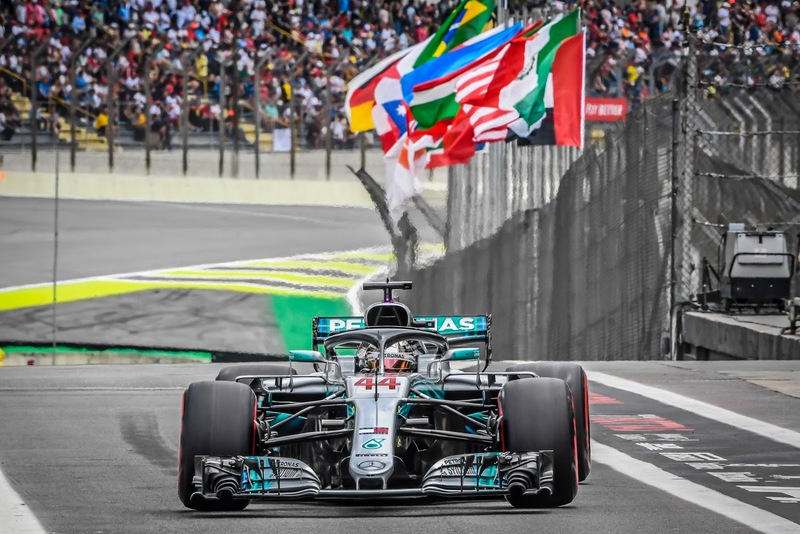 Mercedes led the way for the final go, with Vettel at the back of the pack, Bottas first to go, followed by Verstappen, Hamilton and Ricciardo, who were desperate to space themselves out. Raikkonen was quickest on the second go round and then Vettel went even faster in S1. Hamilton shaved another tenth off across the line and then it was slippery S2, undoing their efforts, dooming Vettel to P2, the gap jumping to 0.093 as T8 was his undoing. As it stood, Bottas and Raikkonen then Verstappen and Ricciardo for the sharp end, then Ericsson, Leclerc, Grosjean and Gasly. Nice exclamation for Ericsson, who is moving onto IndyCar next season, starting P6 once Ricciardo's penalty gets appliedbut with all the hard work to come in the race tomorrow. The hearing was set for 30 minutes after the end of qualifying, so it'll be a state of uncertainty for this report. Still 100th pole for Mercedes, despite the sloppiness and without rain tomorrow, and assuming that Vettel and Lewis both don't get punted off the front of the grid, it will be a fascinating race of alternate tyre strategies at the sharp end. Similarly, Formula B will see a very fast K-Mag on Soft tyres starting P10 thanks to Ricciardo's penalty, chasing the Super clad quartet ahead of him. But it was Marcus Ericsson who was the real winner, outpointing his star quality teammate and starting on the 3rd row of the grid as the end of his tenure as a Sauber driver unreels. Various TV commentators in the past have said that Brazil is an extremely bumpy track. Is it still like that? I did see a lot of titanium sparks.